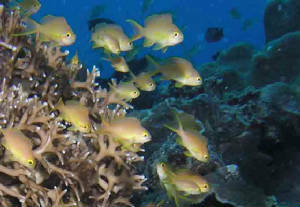 Carmen, the westernmost coastal town of Agusan del Norte, is lined by shallow fringing corals. Even in the Poblacion, our town center, the tabletops are shallow and can be seen on very low tide. But the coasta road causes siltation during the rainy season. 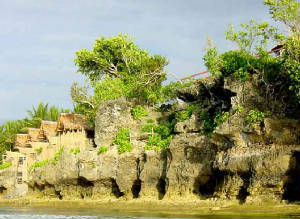 Vinapor, the westernmost village of Carmen, is situated atop a limestone hil and the shore is distinctly formed by limestone cliffs. 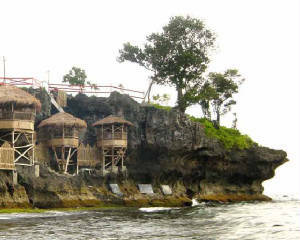 The westernmost point, Punta Diwata, is bounded by the Gingoog Bay on the west and the Butuan Bay on the east. 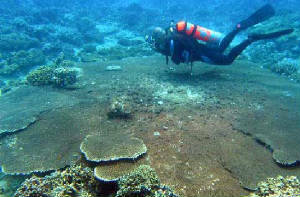 The Punta Diwata sites can be accessed by shore entry. A steep descent through a carved limestone stairs to the beach and a 5 meter walk to the shore. Going back to the resort is, of course, a very steep climb. The rest of the sites will need a banca for best access. This wide tabletop can be seen north of the concrete stairs of the Diwata Caves Resort. It is at a depth of 10 feet and about 30 feet away from the shore. This site is snorkelers heaven. 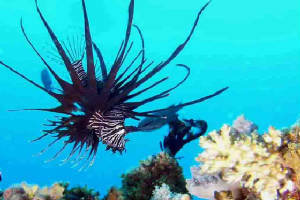 Nothing & nobody can harass this venomous lionfish as it gobbles up the millions of fish fries that fill the seas of Vinapor.